I made this pulav long back and this post has been lying in the draft for a very long time. I was not very sure about the outcome of this pulav first. But to my surprise, my kiddos really liked this one. I didn't make it too spicy. That could be another reason why liked it better. Here goes the recipe. Soak the dhall overnight. Next morning grind it coarsely along with required amount of salt (only for dhall) and green chillies. Steam cook (or Microwave cook it for 5 to 8 minutes, stirring in between) and scramble it. Keep it aside. Now take a pan, preheat oil, splutter mustard seeds, fry red chillies and hing for couple of minutes. Now add the chopped onion and salt (for onion only) fry it till it becomes transparent. Now add the cooked/scrambled dhall to it and mix everything well. Sprinkle hand full of water and cover it with a lid. Let it cook in the low flame. In the mean time, wash and keep the basmati rice ready. When the oil spreads out from dhall/onion mix, now transfer it to the rice cooker along with the washed basmati rice and salt (ONLY FOR RICE). Add 1 1/4 cup of water and mix everything well and cook it in the rice cooker. Serve it hot with raita & chips. We can always increase the quantity of chillies if we want it more spicy. 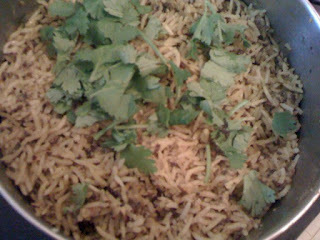 Never thought of making such a pulav with lentils.Nice recipe Vidhya, bookmarking this to try sometime. Highly nutritious and healthy pulao. Very healthy and innovative .love to try this ..
Pulao with lentils, wow...nice idea..looks healthy and yummy.